Jump to the update here. I’ve been putting off publishing the post on this church for reasons that will become apparent towards the end. This is a church with a unique story behind it, from the moment I found it online until a week after I visited it. 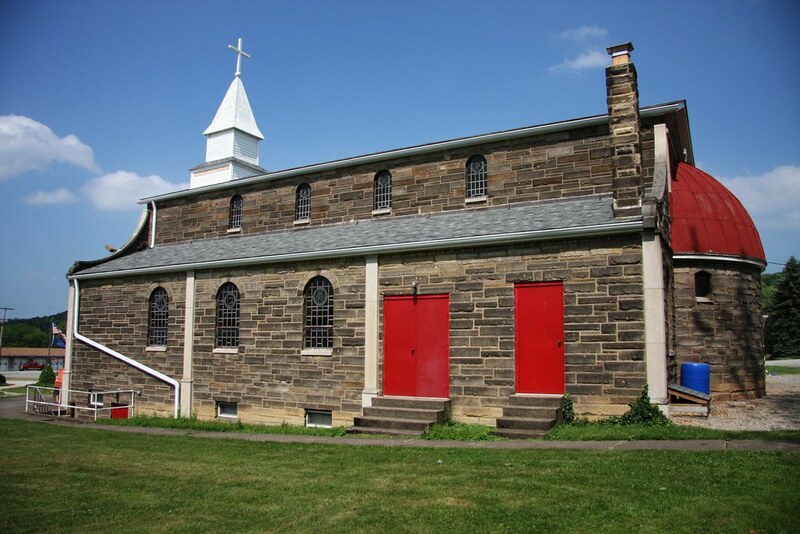 On June 12, the day before I visited the Kirtland Temple and St. James Memorial Chapel, I drove from northern Virginia to Cleveland. The quickest route is one that puts you on the PA Turnpike for a majority of the trip. I’m prone to stopping off at random places for fun, and turnpikes really deter that. The morning I was getting ready to leave, I was debating whether I wanted to pay all the tolls on the PA turnpike or take the back roads. I decided only to take the back roads if I could find something neat worth stopping at. 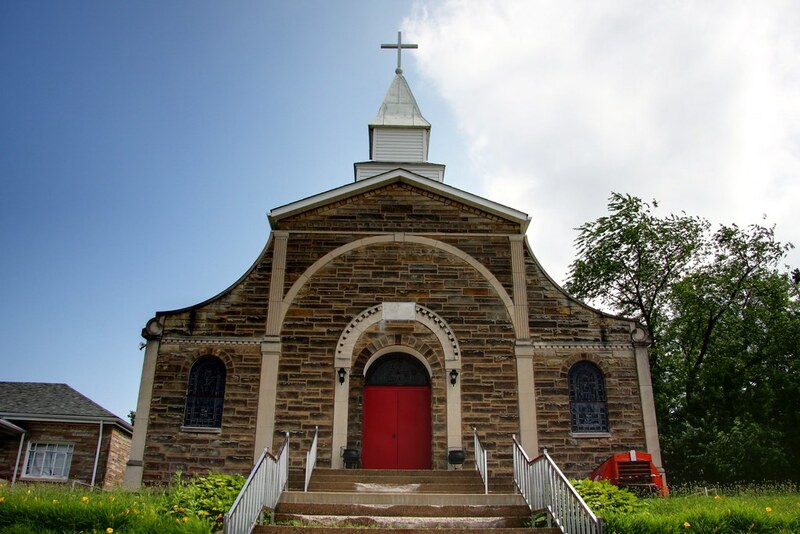 A few Google Maps searches later, and I found the Shrine of Sts Cosmas and Damian in Apollo, PA.
Now, when I find somewhere I would like to visit, I usually google around a bit to make sure it exists, check the hours, see if there’s anything I should be aware of, etc, particularly when it’s something as far away as this. I couldn’t find anything on this place, leading me to believe that it may just be a small, public, always-open shrine (kind of like St. Mary of the Oaks) that – according to Google Maps – is built next to a Baptist church and a funeral home. Had I planned more than a few hours in advance, I could’ve called the local Catholic church to get some information, but what fun is that? Nevertheless, if there’s anywhere that deserves a post of its own, it’s a small shrine with no online presence. So, off I went to Apollo, PA, with nothing but some printed Google Maps instructions to guide me to this elusive shrine. I eventually found the shrine – sure enough, by the funeral home. 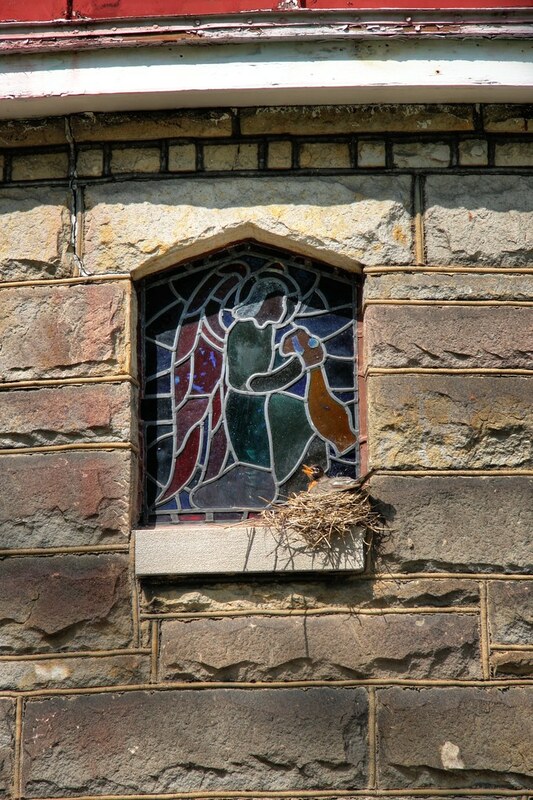 And it was a gorgeous little building – the exterior alone was worth the drive. 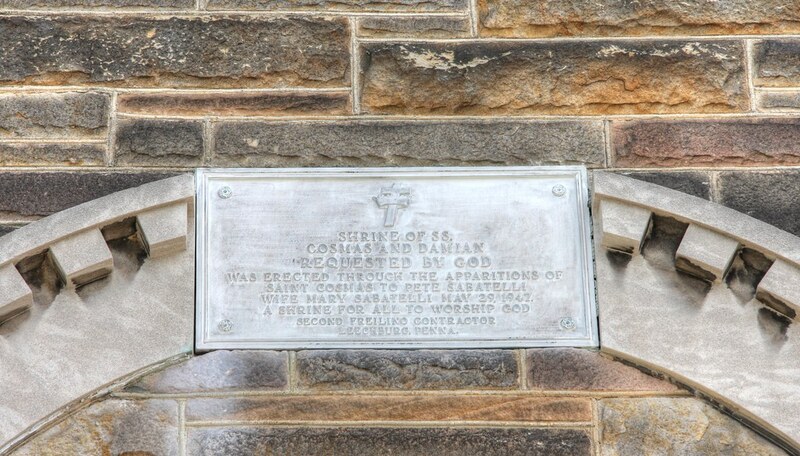 There was a sign at the driveway of the shrine for the First Baptist Church, but aside from the shrine, I saw no church. I checked the doors – locked. There was what looked to be living quarters attached to the shrine, but I didn’t want to bother anyone there. I walked over to the Catholic church across the street to see if anyone was around that I could talk to – no one. Just because I can’t photograph the inside doesn’t mean I can’t photograph the outside! While I was out there with my tripod and camera, a little girl came out of the attached dwelling with her adorable (but sick) dog. We chatted for a bit, and she explained that her father was in charge of the building, and that he could let me in, but he wouldn’t be back for a few hours. I didn’t really have a few hours to spend waiting, so I dragged my feet finishing my photographing and eventually left without seeing the inside. About a week after my visit, I decided to call the Catholic church across the road to see if they had any information on the shrine. The secretary who answered was confused – she hasn’t even heard of the shrine, although it’s right across the street. She fetched the priest, who explained to me that it was a shrine a very long time ago, and was sold to the local Baptist congregation long before he moved in. Ah! Now things are starting to make sense (perhaps you saw it quicker than I did?). I was only able to find a phone number for the Baptist church online, and I gave them a call. The same sweet girl who I met at the shrine answered, and passed me off to her father, who is the pastor of the church. I explained that I was at the shrine on Sunday taking pictures, and he remembered me from his daughter telling him about our encounter. Although he didn’t know much about the shrine, he explained that there are several books and newspapers inside which document its history. He offered to get me some copies of the more useful pieces when he had a chance to look through them all. Wife Mary Sabatelli May 29, 1947. If you’re able to offer any more on the history of this place, please let me know in the comments! Since posting this, I’ve gotten some help from a person who lives in Apollo, PA and sometimes attends the church, and another who is an antique bookseller. Before I jump into what other pieces of the story I have collected, kiskiPlanter on Flickr graciously took this photo of the interior of the shrine (now used as a Baptist church) and posted it for me to share with all of you. 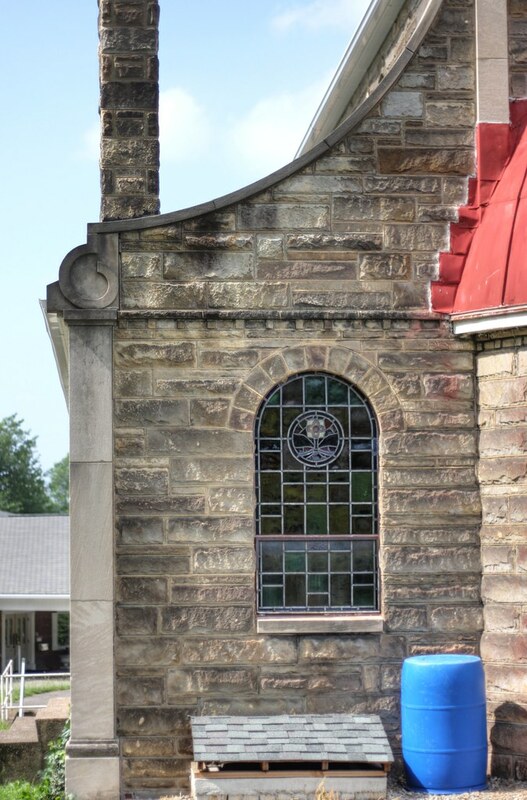 It looks gorgeous inside, and I hope I have the chance to visit Apollo, PA again so I can see it myself. History-wise, it turns out there’s an entire book devoted to the apparitions that appeared to Peter Sabatelli. The bookseller who commented below linked to a catalogue which talks about the book; you can see a similar version of the summary here. If the book wasn’t $125, I’d buy it, since it sounds fascinating. According to these summaries, Peter Sabatelli started having apparitions of St. Cosmas in March 1935. They would come in the middle of the night while Sabatelli was asleep, in the form of six girls and a man dressed in white. This happened 14 times, with the visions delivering predictions to Sabatelli about future events, all of which came to pass. Some of those events were a local flood, America’s entrance into World War II, and the death of the Pope. Sabatelli found roadblocks in his attempts to get the news out; a local paper required such news to be broadcast on radio before being put into print. Finally, a priest agreed to hear about Sabatelli’s visions and report any significant predictions to the local bishop. Despite his perfect record, Sabatelli found his visions to be met with lackluster enthusiasm. His last visit from St. Cosmas asked for a shrine to be built in Sabatelli’s home, with Sabatelli being told he could not leave after erecting the shrine. The home shrine was lit by neon lights in three different colors and reportedly beautiful by those who saw it. As news of the shrine spread, Sabatelli’s residence was soon overrun with pilgrims, prompting him to move onto a larger piece of land and building the shrine discussed in this post. The cost was $160,000, mostly raised through the sale of pamphlets, as Sabatelli was an Italian immigrant with a modest career as a grocer. The shrine was eventually turned over to the Catholic diocese, and then sold to the local Baptist congregation. Someone who grew up in Apollo shares his memories regarding the shrine here. According to this commenter, all predictions were stated after the fact and not taken seriously. Not surprising, given that the shrine was sold off. 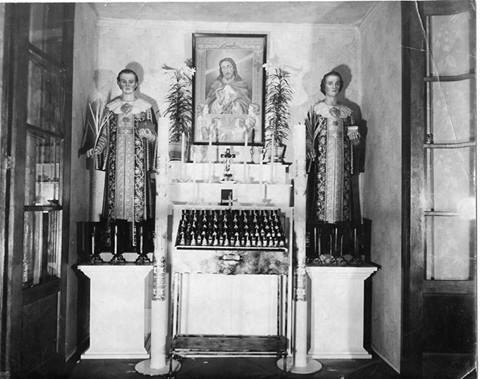 A curator from the Victorian Vandergrift Museum and Historical Society provided the above photo, believed to depict the original shrine in Sabatelli’s home. Thanks for the help! Some good Googling skills to get that. I’ll update this page later with the new info. My grandfather, Secondo Freilino, built this shrine. I visited it quite often as a girl with my relatives. The story of Pete Sabatelli and his visions is quite true. As a young boy I along with a few others played on the construction site during it’s early days. I remember grows use to come by the bus load to visit the sharing on weekends. I have never visited the shrine but plan to. Pete and Mary Sabotelli where my great aunt and uncle. Peter’s was dead by the time I was a child but I’d heard about the premonitions and the building of the church under Peter’s direction. Mary lived in the house attached to the shrine and kept it up until her death (circa 1980’s). 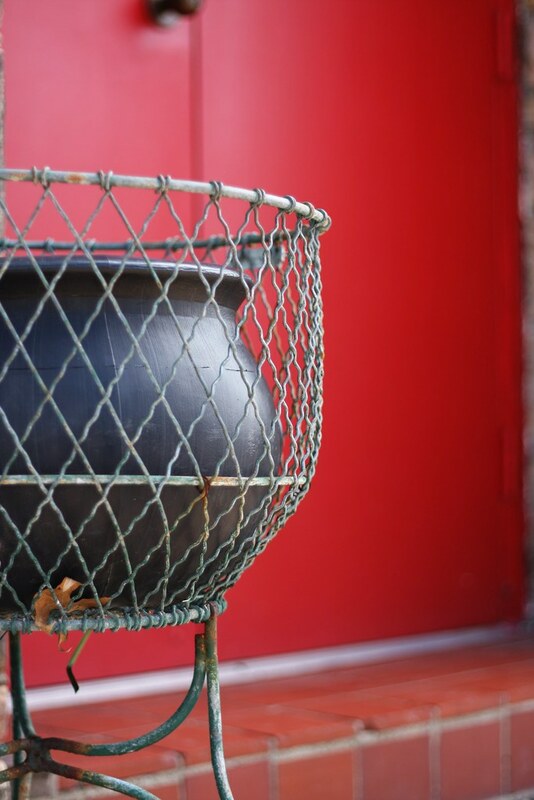 I remember exploring the shrine as a youth as we had many holiday diners with Aunt Mary and the shrine. 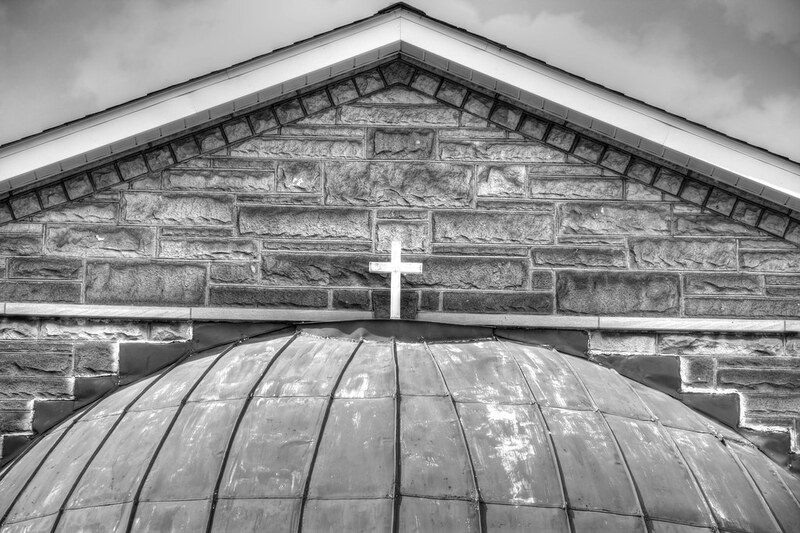 Upon her death, the family attempted to donate the property to St. James Catholic Church in Apollo, however the church did not want the upkeep. The church fell into disrepair. Over the years, a Baptist Church purchased the property and now has services there. The fish pond which used to be filled with Coy and Goldfish is now gone. Thanks so much for the additional information on the shrine! I remember the pond quite well. My grandfather built the shrine. Thanks for the info-its great to see it being appreciated. I just listed the book of it on ebay item no. 111422302994 at 12.95 if you are interested. I grew up on the street that the Shrine was on, but had no idea what it was until now. I had assumed it was a small Orthodox or from another small sect. Anyways I remember the fish pond well, it was full of goldfish. The pond used to be immediately in front of the building. The shrine was in operation until about 1991 or 1992 if I remember correctly. My grandfather built the Shrine.My Dad , Armondo Freilino,helped with the masonry work. I have films of the construction. Gil Freilino. I am currently reading a small, 43 page book on the apparitions of St. Cosmas to Peter Sabatelli. I found in a stack of religious literature an older friend ask me to give away. I live in a town about 45 minutes away from Apollo and never heard of the shrine. Looking to see if the shrine exists, I ran across your article. I would be happy to copy the book for you. It has many pictures that are interesting. Shirley, my grandfather Secondo Freilino built the shrine. Is there anything about him in the book you have? Beverly M. April 27,2017 This is all so very interesting to me. I was reminiscing with my cousin about our Grandmother taking us on religious trips in the late 40’s and early 50’s and mentioned Apollo,Pa St Cosmos and Damian Shrine. She had no memory of it so I googled it and got your wonderful information. Please continue to add to your collection of facts as they come to you. I would especially like more info on the premonitions and their validity. Were they made before or after the actual events?? Anthony Mastro of Port Saint Lucie, Florida, originally from Jeannette, Pa.in 1957 when I was 10 years old my parents took me to see the shrine,all around the altar where statues of Cosmas and Damian stood and both side vestibules were dozens of crutches and braces and canes and wheel chairs that the people left to testify to the miracle healings that they received there, when we went out of the shrine my mother told me to “Remember this place”. I always have.Later in my life rembering this has helped me to believe that miracles sometimes happen.12/24/2017.